Four years after France fell the Allies invade Normandy. Caught by surprise the German defenses are quickly overcome. Heading inland the Allies win major victories against fierce resistance. 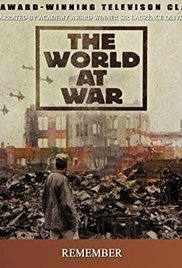 The closing weeks of the European war bring retribution for Germany in the form of carpet bombing cities like Dresden, the collapse of the Whermacht, atrocities by Soviet forces, and finally the fall of Berlin and suicide of Hitler. After the victories in 1941-2, Japanese fortunes reverse as America succeeds in destroying their aircraft fleet and Pacific island bases. At home, shortages of goods and manpower lead to desperation for the population. The island hopping strategy of Admiral Nimitz and General MacArthur leads from one costly, battle after another. The Japanese fight fanatically as the war gets ever closer to home, but Americans finally use their newest weapon, the A-bomb. Following the events from the death of US President Roosevelt through to the dropping of the two bombs on Hiroshima and Nagasaki that prompted Japan's surrender. As wretched survivours suffer deprivations amongst the ruins, half of Germany and eastern Europe trade one socialist tyranny for another as the Soviets take power. Japan is occupied by the U. S., but the colonial empires disintegrate. For many the Second World War was the most significant experience of their lives. These are heartbreaking first hand remembrances from a vast array of survivors from both sides of the war.